Cormier and Ryan won the '04 National Championships. Who will win in '05? 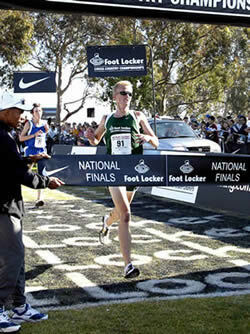 West Regional Champion Ken Cormier of Douglas, Ariz., and Aislinn Ryan of Bellvale, N.Y., won the Foot Locker Cross Country Championships National Finals at Morley Field in Balboa Park in San Diego, Califonia. Beginning with a fast pace, most of the boys’ race was run in a large pack thundering together through the course. Mohamud Ige of Denver, Colo., took an early lead of several meters until the one-mile-mark, when the chase pack began closing in. A group of runners, including Ige, Andrew Bumbalough of Brentwood, Tenn., and John McGuire of Golden, Colo., hit the two-mile point in 9:50. Bumbalough and McGuire moved to the front and were stride-for-stride, chased by the large group. Cormier then appeared seemingly out of nowhere, to become a player in the constant exchange for lead of this exciting race, that was determined in the final stretch. With 400 meters remaining, McGuire led, with Bumbalough in second, and Cormier closing fast. The three were in a dead heat, and then in the final 200 meter stretch, Cormier moved into the lead, just managing to hold off Bumbalough, for the win in 15:22. Bumbalough placed second in 15:24, and Mark Matusak (Torrance, Calif.) placed third in 15:26, pulling ahead of McGuire who placed fourth in 15:27. The girls’ race also started with a fast pace led by Ryan, Midwest Regional Champion Ramsey Kavan of Yankton, S.D., West Regional Champion Marie Lawrence of Reno, Nev., and Zoe Nelson of Kalispell, Mont. The group constantly battled for the lead throughout the race. At the two-mile point, Ryan pulled ahead to gain about a seven-to-eight meter lead over the group. Ryan, who placed second in the Northeast Regional race, increased her position over the remainder of the course, stretching it out for the win in 17:31. Lawrence, who chased Ryan over the last mile, placed second in 17:39, Kavan placed third in 17:47 and Nelson ended up placing eighth in 18:09. The runners competed under sunny skies with good course conditions. The weather was unseasonably warm, with temperatures in the mid-seventies for the girls’ race, and cooling down a bit as a fog rolled in for the boys’ race. 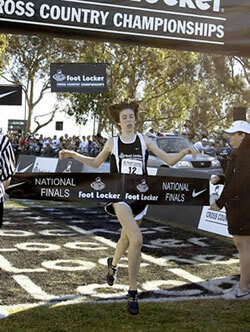 The Foot Locker Cross Country Championships is comprised of four regional 5K races, which took place across the country in the Midwest (Kenosha, Wis.), Northeast (Bronx, N.Y.) and South (Charlotte, N.C.) on Nov. 27, and the West (Walnut, Calif.) on Dec. 4, culminating in the National Finals here today. Ryan takes off and starts to pull away. Ryan leads by 40m with 300m to go. McGuire was ahead with 300m. Cormier came on strong and passed Bumbalough and McGuire. Bumbalough went with him and it was neck and neck for the last 100m. Cormier crossed the line just ahead of the South Regional Champ. Click on an athlete to view bio information on the athlete. States competing: CT, DE, ME, MA, MD, NH, NJ, NY, PA, RI, VT, WASH D.C.